Opening may have come in a difficult moment, but this latest German stadium offers potential to play even in the Bundesliga without fear of infrastructural requirements. It may only be red tinware, but it’s decisive for this stadium’s aesthetics. The vivid outer cladding penetrates Continental Arena’s concrete frame, while open spaces underneath the stands add lightness to the outer appearance. Perhaps most crucial are the cut-out corners, which make this stadium unique. 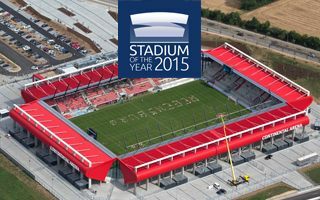 Enough for you to support the only German nominee in this year’s Stadium of the Year? Worth over €50 million (significant increase from early estimates), Regensburg’s new stadium has all an aspiring football club could ask for. The eastern side offers extensive hospitality facilities and floor space utilized by the naming rights partner, Continental. There’s also more than enough room for traditional standing fans of SSV Jahn, who received the whole south stand at their disposal (considered the soul of their new home). Together with the away section there’s over 6,000 standing places, a feature many English supporters could admire with envy. Capacity of over 15,000 covered places would have been enough to satisfy the club’s needs, but opening came in a hard time for Jahn. When plans were drawn for the stadium, players were expected to go towards the Bundesliga.